One of the most important things to do when you begin producing work for university is to make sure it’s properly saved and organised. It may sound obvious – but during my time both studying and working in a university I have lost count of the number of students crying over lost work due to computer malfunctions. First, let’s talk about saving your work. Firstly, make sure you save your work as your working – not just at the end of each session. Depending on which programs you’re using, this might just be a case of setting up an autosave, or you may have to remember to save at regular intervals. In most PC programs (I don’t know about Mac), pressing the CTRL key and S key simultaneously will save your work. Get to this options panel by clicking the Office button (the round one in the top left) and selecting ‘word options’ which appears at the bottom of the pane. If you’re using a Uni computer, then the autosave option is less useful, here you should get into the habit of pressing the quick save keys as you type (CTRL+S). You should also always back up your work, whatever computer you’re using. This is essential, lack of backups + computer failure = hysterical crying students. Cons: You can break or lose any of these storage devices – of course, if you also have a copy of the document on your computer, this shouldn’t be a problem. The only time you might feasibly lose both your hard storage and computer copy is through a disaster like theft, flood or fire if the computer and external storage device are stored together. Cons: some sites have an upload limit and will then charge for storage, uploading documents can take a long time. It is highly unlikely, but feasible that your data could be hacked. So now you’ve got your data saved you ought to have it organised. This is important for everyone. Admittedly, if you are on a writing-based subject (Psychology, History, English, etc.) 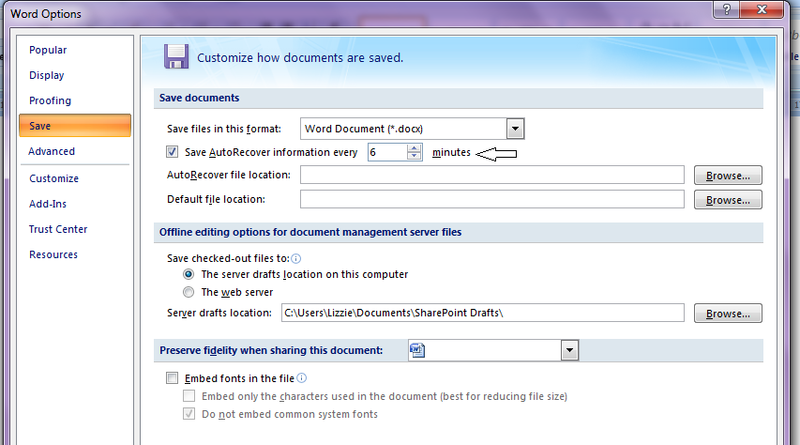 you can fairly easily ferret out a document from anywhere in your computer using the search feature, provided you can remember some of the content of that document. For image-based subjects (Graphics, Architecture, Fashion Design) there is no such quick fix, so having documents clearly labeled and in module-specific folders is a must. A good system is having a folder for each year of university, each containing module-specific folders and having those subdivided again (for example, by lecturer) if that makes sense. Please don’t neglect these very easy measures! They can make the difference between meeting a deadline and being capped at 40% for not being able to hand work in on time. 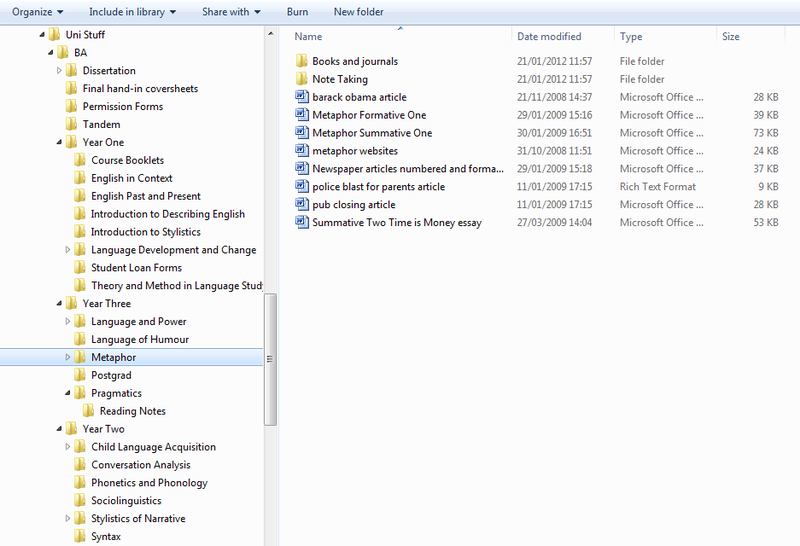 Categories: Tips and Tricks | Tags: academic writing, essay, external hard drive, microsoft office, microsoft word, tips and tricks, word options, writing, writing style | Permalink. Hi, I'm Liz. I like easy crafts, photography, cooking, lifestyle blogs and YouTube videos. I work as a part-time proofreader and am currently studying for a PhD in linguistics.